I have always had an attraction to music and its structure. Drums always come first – High-hat that counts the tempo, kick drum drum that lays the beat down and the snare that snaps and brings the sharp staccato to the beat. Of course, after that comes the baseline, the guitar and then the harmony- synths keys, and anything else. There are a lot of ways to bring music to life, the ingredients need balance, but the first thing they need is the tempo. I have decided to have this as the concept for my final project in this course, an interactive audio/visual music box that is generated through physical tempo. I plan to build a table filled with gears of different sizes. The user will be prompted to build his own composition with the gears, similar to a puzzle. When done, he can turn the main gear – thus moving all the gears in correlation to that main gear. Each gear holds a certain element of the composition – a drum, cymbal, baseline, keys, synths and more – and the user can choose weather he wants to add it to the recipe or not (editing a certain gears notes is an option too). Each gear’s rotation speed will be measured by a rotary sensor that will play the gears part accordingly – all parts will be synced to the same master gear. Another element for this project is the visual projection. From the top will be projected a visualization for each cog that is added by the user by projection mapping. The user could change samples and part through an interface incorporated in the project. 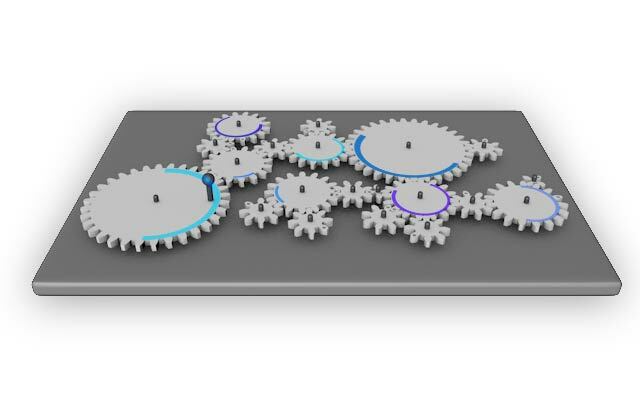 First illustration of the gears in motion. Illustration of the projection mapping.